In an evolving comms landscape, these 50 power players have the blueprint for effective global strategies as companies expand into new markets to increase growth and agencies promote their integrated business models. PRWeek enlisted mentors, colleagues, and friends to best describe what puts these influential PR pros in a class by themselves. 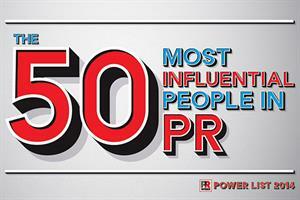 The 2014 Power List differs from previous years in that we enlisted various powerful people to write the profiles of some of the most influential people in communications. Seven years may not seem like a long time, but in terms of what is being accomplished by those at the leading edge of the industry, it is light years. Richard Edelman and Jon Iwata have made it on every list since 2007.